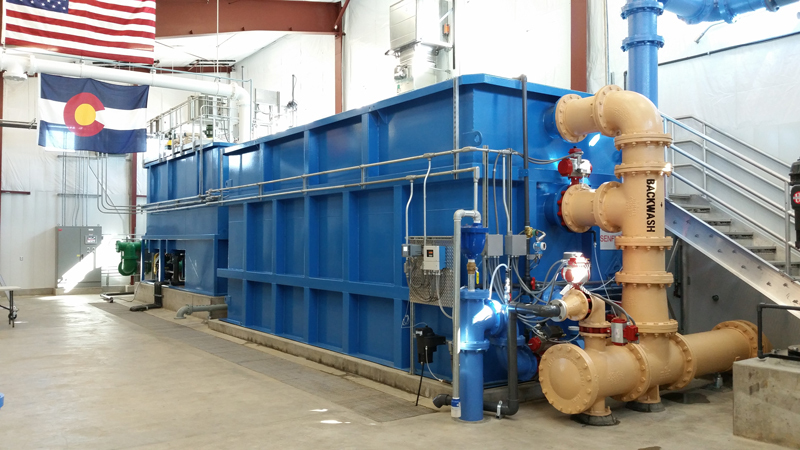 DESCRIPTION: Integrated Water Services, Inc. (IWS) has completed the construction and start-up of the $7.1mm Bayfield Water Treatment Plant Expansion project located in southwest Colorado. Bayfield is a rural town and partnered with the local La Plata Archuleta Water District to upgrade and expand the existing water treatment plant that will serve the town and surrounding areas. The project included the demolition and upgrades to the intake facilities, modifications of the existing plant building, construction of a new water treatment plant, and completion of all the work while the existing plant remains in operation. Upstream of the plant, work includes demolition of the existing raw water intake and check structure, resetting of the existing in-ditch parshall flume, and the construction of a new raw water intake structure. Within the existing plant, work included: removal and replacement of an existing vertical turbine pump, upgrades and re-purposing of the two remaining existing vertical turbine pumps along with all the associated electrical and control system improvements, the removal and replacement of the existing Trident filtration media and underdrain systems, the relocation of the chlorination system to the proposed building and the installation of chlorination and coagulant feed lines from the proposed facility to the existing system. a) The construction of a below grade 500,000 gallon, water-tight concrete clearwell that required over 1,300 yd3 of concrete and 175 tons of rebar. Given the size and complexity of the concrete scope, the structure was formed and poured in various sections over four months. b) Below grade yard piping structures. c) Below grade backwash recovery tankage system including a conveyance trough, high rate sedimentation system, solids collection system, backwash recovery pump station, and valve vault. d) Construction of a new prefabricated metal building above the concrete clearwell. f) Emergency generator and all associated process yard piping, drainage piping, electrical cables, conduits, and gas lines. g) Electrical instrumentation and controls. IWS worked closely with the Project Engineer, FEI Engineering, to address changes in field conditions and remain on schedule. When IWS was constructing the concrete clearwell, unexpected shallow groundwater was encountered which required the construction of eight extraction wells to dewater the site. IWS quickly mobilized the resources to dewater the site and keep the project on track so that the concrete work could proceed before the onset of winter. Ron Saba, the Town of Bayfield Public Works Director, was very pleased with Integrated Water Services performance on the project, and said “IWS did a great job in maintaining the schedule and staying ahead of the constructibility issues, which included unanticipated dewatering for the main excavation. I would highly recommend IWS for future projects”.